The Kentucky Division of Mine Safety teams battled it out in a skills contest at Jenny Wiley State Park for two days in mid-April. While the Harlan regional office’s mine rescue team was named the overall champion, all teams gained valuable skills practice at the event. 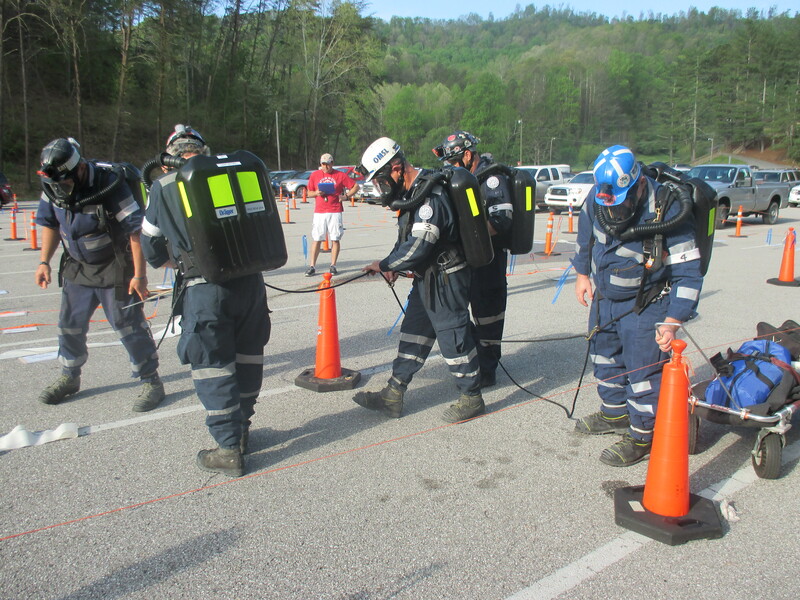 Rescue teams from Barbourville, Madisonville, Pikeville, Martin, Harlan and Hazard counties took part in the April 19 and 20 contest that tested skills that could potentially save lives in a mining emergency. “In the field competition, teams are given an emergency situation and are timed and observed by the U.S. Mine Safety and Health Administration (MSHA) qualified judges as they move through the course to locate, treat and move staged victims to the surface,” said James “Jat” Tabor, a member of the Madisonville mine rescue team. Mine rescue contests are required bi-yearly by MSHA, requiring team members to solve a hypothetical problem while being timed and observed by judges according to complex rules. Captain: This person leads the team and makes final decisions with input from other members. Communications: This team member maintains communications with fresh air base (where rescue teams can safely breathe without a breathing apparatus) and ensures team’s general well-being. Gas person: Someone who is proficient in knowledge of mine gases that could be hazardous. Map person: This team member maps the route that the team takes through the mine and the conditions encountered. Fresh air base (FAB) specialist: This person monitors and controls activities at fresh air base while maintaining communications with team and command center. Some teams add a second person at the fresh air base, an underground station located in the intake airway, and someone in the command center. The FAB specialist becomes the information middleman between the command center and the rescue team in the mine. The FAB should be as close to the emergency as safety will permit, adequately ventilated and in constant touch with the surface by telephone. On the first day of competition, the Madisonville team took first place, the Hazard team took second and the Harlan team placed third. On day two, the Harlan team placed first, Hazard placed second and Barbourville took third. A mine emergency may result from a number of causes such as a fire, an explosion, a wall collapse or an accident involving equipment. In a mine the fresh air is distributed by fans, permanent structures and temporary barriers (curtains made of specialized cloth called Brattice Cloth). During the rescue contest, the rescue teams must map the air flow and air flow changes. Team members must also wear a self-contained breathing apparatus that gives them four hours of breathable air. Teams are judged on how close their maps are to the test mine map, how they moved Brattice Cloths to ventilate air flow and how quickly they rescued the miners. The page on the right with the red squares is the team map and the other one is the FAB Specialist’s map. They are graded on how close they are to one another. The FAB Specialist He was watching the time, communicating by radio with the team in the mine and drawing his map. If the team inside got into trouble, he would use his map and lead a team inside to find the first team, so he needed to know where they were and what hazards they ran into. Back-up FAB Specialist making a digital map. Drawing the map as they move through the mine. The Fresh Air Base. This is where the FAB specialist sits and talks to the team by radio and builds his map. They put him in a tent with a tarp in front so he can’t see his team. Working the problem as a team. In the mine. The cloths with the orange hooks represent moveable airflow barriers. Madisonville team hooking to secure line. Madisonville team putting air tanks on.